I’ve been working on my January menu plan. Right now at 25 weeks pregnant, I am slowly implementing the Trim Healthy Mama diet. I may never be totally “on plan,” but it feels good to finally decide to get rid of the sugary foods that I’ve been eating and craving. 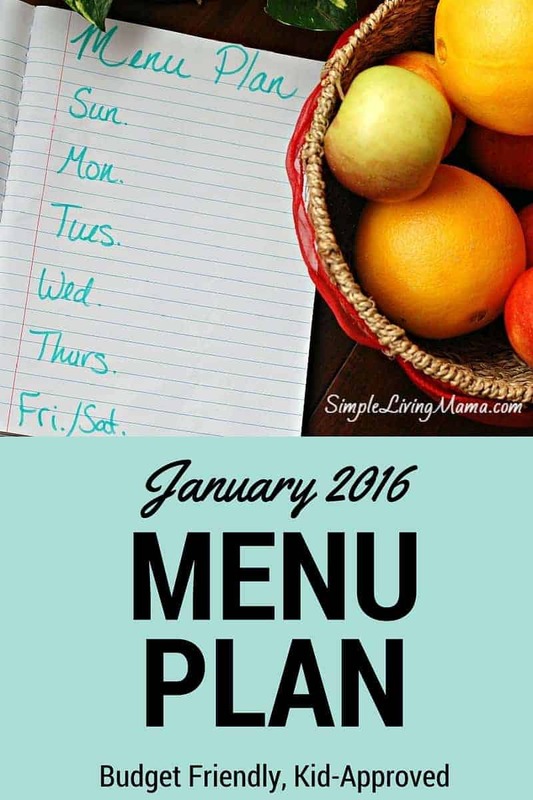 For this month’s menu you will see some of my favorite stand-bys plus some new Trim Healthy Mama approved dinners that we will be trying out this month. I’ll be doing some careful substitutions for myself such as using spaghetti squash or zucchini instead of pasta, or making cauli rice when my family eats regular rice. Since I am pregnant, I will continue eating what is known as S-helpers and Crossovers. In other words, I will mix good fats and good carbs together. Sub sandwiches, chips (This is something easy, peasy. I can use Joseph’s pitas for my bread). We will have our usual breakfast stand-bys. Oatmeal, cereal, fruit, pancakes. I am making some egg muffins to have in the fridge for quick grab and go meal. Lunches always consist of either leftovers, egg salad, tuna salad, or just regular salad. The kids enjoy PB&J, yogurt, and fruit.